Elvis Presley meeting Richard Nixon. On December 21, 1970, at his own request. Photo by Ollie Atkins, chief White House photographer at the time, Wikipedia Commons. When Elvis Presley died in 1977 from drug abuse, he was an official, badge-carrying federal agent for the Bureau of Narcotics and Dangerous Drugs, an honorary appointment granted by President Richard Nixon. 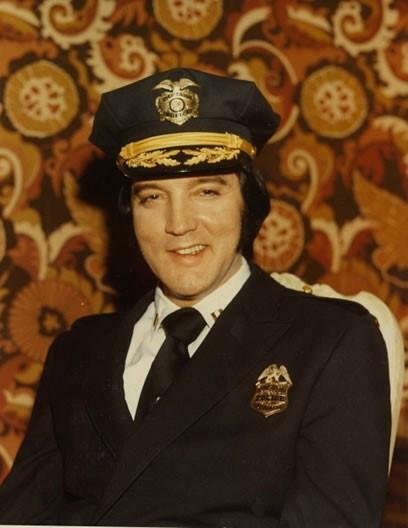 To say that Elvis Presley had a respect for law enforcement is to drastically understate his enthusiasm. Elvis Presley’s Memphis police badge and ID. In another life, he would have liked to have been a police officer, and he was obsessed with collecting police badges and uniforms. When he would perform shows around the country, he always made an effort to obtain a badge from the local police force, sometimes by using his celebrity status and other times by donating money to police functions. In some cases, he would offer a $5,000 donation to a police ball in order to procure a badge. He was also known to give expensive cars to local sheriffs, including Sherriff Bill Morris of Memphis who gratefully deputized Presley after receiving a gift of a Mercedes-Benz. In 1970, California senator George Murphy promised to get Elvis a meeting with FBI director J. Edgar Hoover and Bureau of Narcotics and Dangerous Drugs (BNDD) director John Ingersoll. In both cases, Elvis was hoping that a generous private donation would be enough to buy him a federal badge from each of these departments. Elvis Presley posing in his Denver police uniform. Elvis never did get to meet Hoover, and when called the BNDD, Ingersoll was out of the office. He spoke, instead, to the number-two man of the Bureau, Deputy Director John Finlator. The deputy director was not swayed by Elvis’s fame or money and informed him that his department could neither accept donations nor issue honorary badges. Elvis’s offer was spurned. On December 21, 1970, President Nixon agreed to meet the King. In full form, according to an interview given by Egil Krogh, Nixon’s aide who received Elvis, he arrived “in a purple jumpsuit and a white shirt open to the navel with a big gold chain and thick-rimmed sunglasses.” The meeting with the president got off to an awkward start, with Elvis complaining to Nixon about the difficulties of performing in Las Vegas and expressing his anger for The Beatles. Nixon gave the order to get the King a badge, which elated Elvis so much that he crossed to the other side of the desk and gave the president a bear hug. Elvis then had his body guards bring in the gifts he had brought with him, which he lavished on the president and his aides, including jewelry for their wives. Before leaving, Nixon and Elvis posed for one of the most famous photographs ever taken in the Oval Office. Elvis was now a badge-carrying drug warrior, and he carried his badge with him for the rest of his life, until he died seven years later from a drug overdose. *Chris Calton is a Mises University alumnus and an economic historian. He is writer and host of the Historical Controversies podcast. See also his YouTube channel here. Are we supposed to comment on an article that absolutely provides ZERO information that has not ALREADY been made public in 1,234 biographies, countless TV movies, one big screen motion picture, ten thousand newspaper articles, 370,000 hits at any internet search engine, as well as a subject of at least one personal exhibit in a major Presidential Library? The unvarnished truth is that the article was not informative at all…. Not alone was it not informative. The article is predicated on hypocrisy of Elvis getting an anti-drug badge when he was a drug addict. There was no hypocrisy, as Elvis only consumed legal drugs, i.e. medicine prescribed by a doctor.